It's a bird! It's a plane! Nope. It's a Nissan Juke Nismo and you might need to get your eyes tested. Jonathan Crouch reports. Positioning the Nissan Juke as a sporty car might well be a step too far for some, but the 200PS Nismo version is quick, handles well and is strong value for money. It offers a choice of front or four-wheel drive like many hot hatches but has a practical side too. This improved version has a much bigger boot and cleverer hi-tech equipment options too. Overall, it's weird but surprisingly sensible. If pressed to name the most surprising car I've recent years, I'd have no real hesitation in naming the Nissan Juke with the 1.6 DIG-T engine. Here's a car that many take to be an overstyled soft-roader crossover thing that instead had the chassis dynamics of a hot hatchback and a pretty good one at that. Pimpled youths in Saxos would watch the Juke zip away from them, confident they'd catch it up in the bends, only to see it disappear from view. Track one down if you're looking for a left-field used buy. 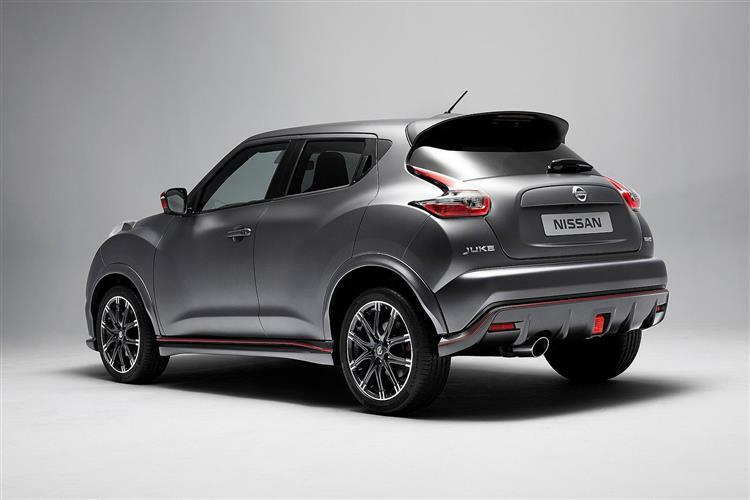 If you're shopping new, Nissan has a treat in store for you in the shape of that car's logical extension, the Juke Nismo. 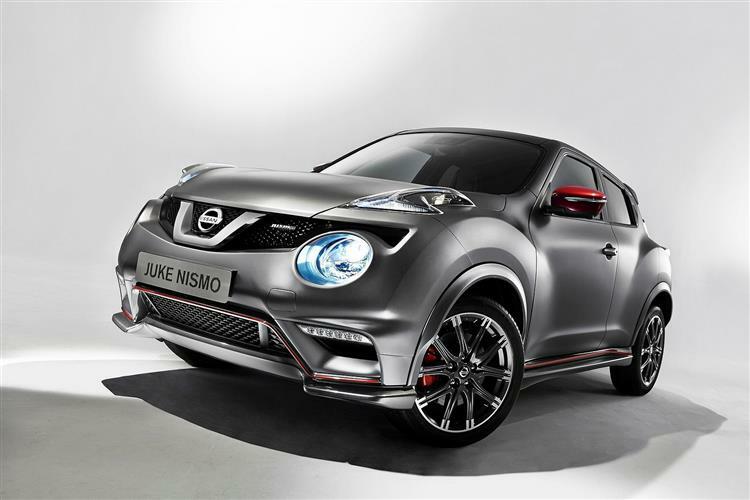 As those of you who are steeped in Japanese performance cars will probably know, Nismo is the motorsport tuning arm of Nissan and this Juke model was the first of a whole range of Nismo-branded models to be offered in the UK. With power and suspension tweaked and featuring more aggressive styling, it's well worth a look, especially in this revised guise with its bigger boot and extra connectivity and personalisation options. The 1.6-litre turbocharged direct injection petrol engine gets another 10PS teased from it, offering a healthy 200PS output. Torque rises to 250Nm between 2400 and 4800rpm, so this isn't one of those engines that you have to absolutely cane to make rapid progress. In the 2WD version, it'll get to 62mph in 7.8 seconds and keep going to a top speed of 134mph. If you need more, then there's a 215PS Nismo RS variant on offer. This accessibility of performance is reflected in the car's chassis set up. Nissan hasn't gone overboard and has instead subtly adjusted what was already a very capable platform by increasing spring rates by ten per cent, while working to optimise front end grip and offering a quicker geared steering system. The front-wheel drive chassis is more than capable of handling this power output and it's questionable whether directing drive to all four wheels would make this a better car. Nissan offers the Juke Nismo with all-wheel drive and a CVT gearbox, but unless you really want to rest your left leg, the front-wheel drive manual car is the better bet and better value by far. 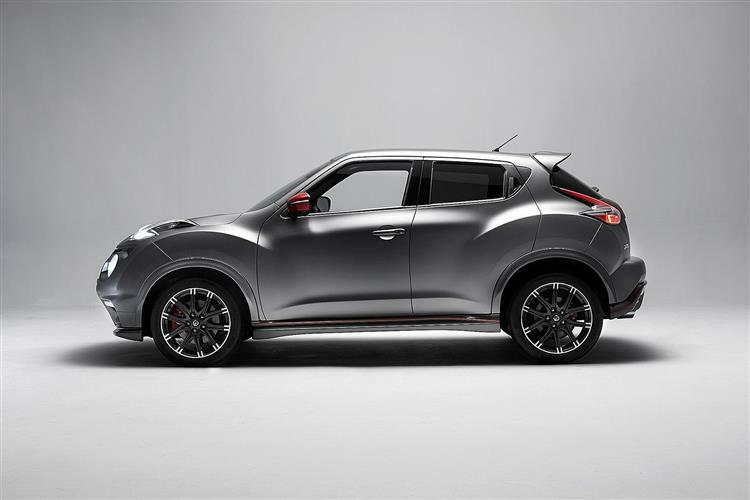 Nismo has given this Juke a look all of its own with front and rear Nismo badging, 18-inch Nismo wheels and a subtle body kit featuring signature red door mirrors with a matching lower red pinstripe. There's also a signature front grille and LED daytime running lights. But the changes are more than just cosmetic. The aerodynamic addenda, which features lower front and rear bumpers, wider wings and sill side skirts, plus a modified grille and tailgate spoiler, helps to reduce front and rear lift without increasing drag. Even after having been sale for a few years, the Juke's styling still takes a bit of getting used to. After a while, you grow accustomed to its unconventional lines and begin to revel in the fact that here is a really bold and interesting piece of design. It's just as interesting inside. Although sacrifices have clearly been made on materials quality to offer such an eye catching price, there's a heck of a lot of styling going on inside. The motorcycle-style clocks and centre storage bin that apes a bike petrol tanks are brilliantly conceived and Nissan's Dynamic Control interface will appeal to the most exigent button prodder. There's respectable space inside too, with a these days much bigger 354-litre boot that can be extended to 1,189-litres with the rear seats folded. I'm still not sure how Nissan has been able to offer this Juke Nismo for only just over £20,000, but then I was always astonished at the value proposition of the standard 1.6 DIG-T model, a car that so few people seemed to realise existed. Even if it were quite a bare bones thing on the inside, the asking price of this Nismo model wouldn't be unreasonable but it's absolutely packed with gear. 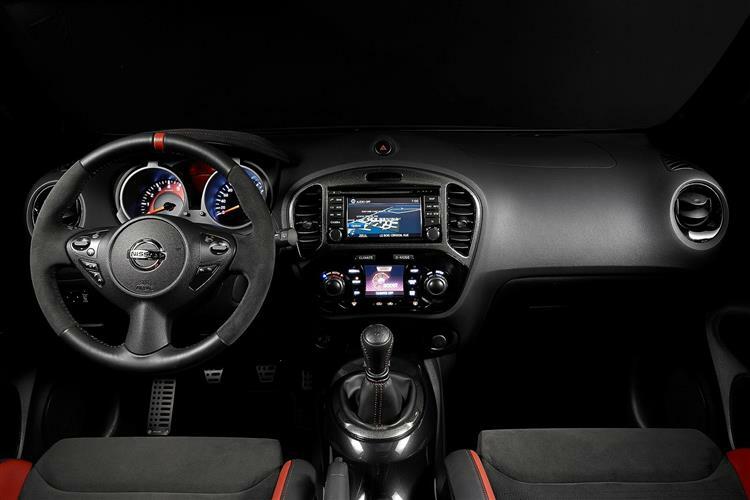 It gets suede-trimmed Nismo sports seats with red stitching and deep side bolsters, along with Alcantara and leather trim for the steering wheel and suede trim for the door liners. Other changes include a black centre console, black door switch surrounds and a black headliner. Red Nismo signatures are also carried through to the dashboard gauges, gearknob and gaiter. If you go for the CVT auto 4x4 version, there's a premium of around £2,200 to pay. If you want extra poke for your Juke Nismo, a premium of around £1,100 on either model will get you the even more exclusive 215PS Juke Nismo RS model. Whichever variant you decide upon, safety is well catered for with six airbags and ESP stability control. There's also gear like electrically folding and heated door mirrors, an intelligent key and an engine start button, rain-sensing wipers, climate control, cruise control and a trip computer. Compared to something like a Skoda Octavia vRS, the Nismo Juke looks extremely strong value indeed. As with most performance cars in this bracket, the Juke Nismo isn't going to be a big winner in terms of residual values with a respectable figure of around 45 per cent predicted after three years and 30,000 miles. That's a good return compared to other GTI hatches. It's better even than the trade-in you'd get on a Volkswagen Polo GTI, a car that you might think had sounder resale prospects. Day to day running costs aren't too severe either. Despite its added power, the Juke Nismo records the same economy and emissions figures as the 1.6 DIG-T model, which for the 2WD model means fuel economy of 40.9mpg and 159g/km CO2 emissions. Choosing the all-wheel drive model with the CVT box will knock that back a bit to 38.2mpg and 169g/km. If you're one of those people who thinks all new cars look the same and that the excitement and personality has been ironed out of new vehicles by countless committees and customer clinics, the Nissan Juke Nismo will come as a breath of fresh air. It's bold, it's great fun and it won't punish you at the pumps or in terms of practicality. This Nismo version beefs up the visuals with a sporty body kit, big wheels and a tonne of attitude, but thanks to its 200PS power output, it's certainly hasn't got the mouth/trousers ratio wrong. The interior is well appointed too, with suede sports seats and door trims, a hardwearing Alcantara finish on the steering wheel and a black and red fascia colour scheme. For £20k it looks good value, but also throws light on the fact that the standard 1.6 DIG-T non-Nismo model remains a steal. As long as you can get along with the styling, there's very little not to like.